Before the 2013 Subaru BRZ even went on sale, Internet commenters insisted that it should have a turbocharger and sportier tires. 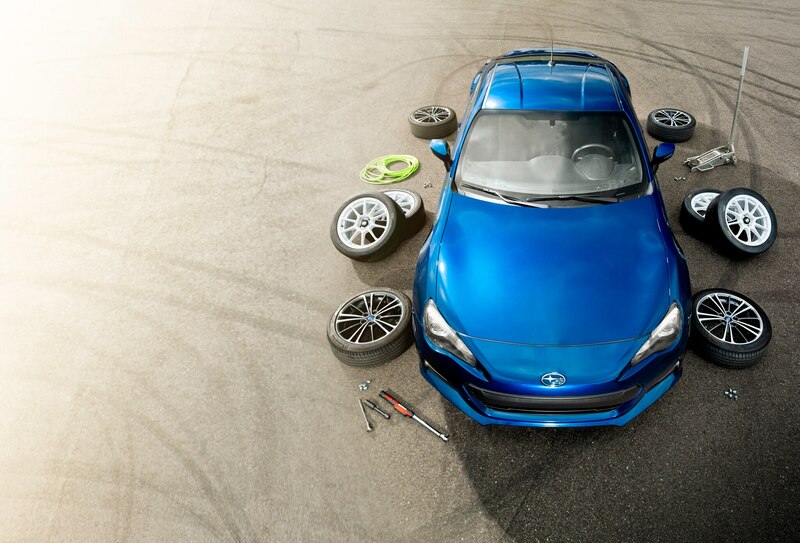 However, a turbo or a set of ultrasticky summer tires could easily upset the delicate balance between grip and power that makes the BRZ so much fun on regular roads. On the other hand, it’s entirely possible (although not necessarily easy) to load a second set of wheels and tires into the BRZ for track days. Jackpot. Gara wheels; total cost $1768. They weigh 39.8 pounds per corner, a 1.8-pound savings over the stock 17-x-7.0-inch wheels and 215/45R-17 Michelin Primacy HP tires. Next, we booked track time at GingerMan Raceway and loaded up the Vbox. Our test driver, Marc Noordeloos, recorded a 1:45.39 lap on the 1.88-mile track with the stock tires. He was surprised: “As long as you respect the Michelin tires and don’t overdrive the car, it’s amazing how well they perform.” Rear wheel-drive novices would be well served to stick with the stock rubber until their driving skills improve. Then we bolted on the BFGoodrich tires and went out for another set of laps. Even before learning his lap times, Noordeloos proclaimed that the track tires transform the car. His 1:38.95 lap clearly illustrates that point. The only issue was that, although the Subaru’s chassis didn’t mind the extra grip, the brakes were quickly outmatched. After only a few laps with R-compound tires, the stock brakes were smoking. Anyone looking for big bang-for-your-buck improvements for their Subaru BRZ should upgrade the brakes before considering a set of wheels and tires for track days. The BRZ doesn’t need more power.